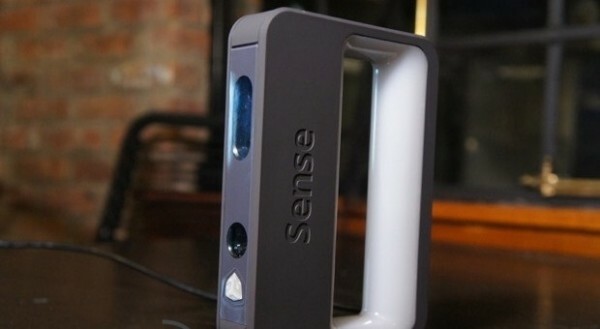 3D Systems’ Sense scanner #3DScanning #3DPrinting « Adafruit Industries – Makers, hackers, artists, designers and engineers! Just in time for Engadget Expand, moments ago 3D Systems launched a compact $400 handheld 3D scanner that Engadget describes as “ready to transform 3D printing as we know it.” Interesting 3D scanners appearing every day! “Game changer” isn’t a term that ought be thrown around loosely. It’s the kind of thing that loses value each time it’s uttered — sort of how everyone’s a “genius” of some kind or other these days. Every so often, though, we get to spend some time with a product that seems to wear the moniker well. We’re going to hold off here, of course — wait until we’ve spent some more time 3D Systems’ Sense scanner and more or less dance around the phrase in the meantime. But man, we’ve been pretty ecstatic about the Sense since we saw it in action a day or two ago. You see, ever since desktop 3D printers became a realistic possibility for consumers, we’ve been waiting for a missing link — something that would fill in the gap between concept and creation, without the formal training required to learn CAD. It’s clear, of course, that a solution is on its way, given the massive sums of money currently being pumped into the space. After all, whoever becomes the first to unlock such a thing would have a considerable advantage among the dozens of companies vying for the top prize. MakerBot swung for the fences with the Digitizer, an attempt to do for 3D scanning what its Replicator line has done for 3D printing. And indeed, we were largely impressed with the product during our hands-on earlier this week. The $1,400 lazy Susan-esque device will no doubt find success among the maker community the company has successfully courted…. Read more. And check out the MakerBot Digitizer in our store for a “maker community” take on desktop 3D scanning.